Air temperature is greatly influenced by microclimates, and urban areas have disproportionately higher temperatures due to the thermal properties of humanmade materials, lower vegetation cover and less evapotranspiration, as well as complex surface morphology that traps outgoing longwave radiation. Being able to map the intensity and extent of urban heat islands with existing data enables mitigation of the negative ramifications for health-related heat risk (Tomlinson, Chapman, Thornes, & Baker, 2011). 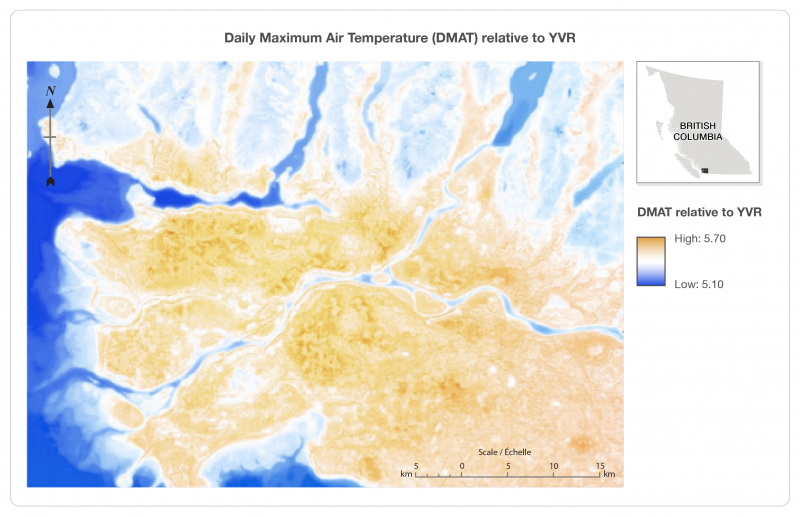 Hung Chak Ho and Dr. Anders Knudby, researchers from Simon Fraser University, are combining weather data collected by volunteers, government weather stations and remotely sensed data to understand and predict temperature variability in Vancouver, BC. These researchers are most interested in summer months because of the changes in climate because significantly higher temperatures in the summer increase health risks, especially for certain populations such as the elderly and others with social and emotional vulnerability (Kovats & Hajat, 2008). Their analysis found large (~10 °C) temperature variability across the urban landscape, with hotspots located in areas with low vegetation cover, few water bodies and dense urban development far from the coast. The unique methodology incorporating remote sensing, citizens and weather stations helps identify not only such hotspots but also sheds light on the factors that influence local temperature variability. Combined with information on the location of vulnerable populations, this information can help health authorities guide emergency response during extreme heat events, and can inform prioritization of urban greening and cooling initiatives. Case Study 2: Urban Heat Islands, Health and Spatial Technologies by Geography Open Textbook Collective is licensed under a Creative Commons Attribution 4.0 International License, except where otherwise noted.